ShBlog: How Does God Define "Good?" I recently wrote about my GMO correspondence with a contact in India whom I called "Raman" (not his real name). I'm pleased to share that Raman has continued his correspondence with me, and has continued to ask very good questions. I think this is a good sign that God is working in his heart. Raman, I think you've asked a wonderful question. I believe Scripture teaches that we as human beings have a somewhat innate yet very limited ability to judge goodness. We look at a person like Mother Teresa and we conclude, "She is good because she spends her life helping the needy" (a good thing, as most everyone knows). We look at another person (and there are a lot of them out there) and we conclude, "He attends church all the time and pretends to be good, but in reality he doesn't care anything for his neighbor ... so in reality he is bad, he is a hypocrite." Everyone intuitively knows this is bad behavior. We make such broad-stroke judgments of goodness and badness, based on the image of good which God has placed in us. But the problem is that we don't judge perfectly, and we especially can't judge ourselves. We don't know the heart of others, barely even know our own hearts; and moreover, we hope that God grades US on the curve. The Bible reveals very clearly, however, that God's standard of judging goodness is wholly different than ours — it's a lot tougher. It may not seem fair to us, but He measures us against the standard of His perfect goodness and holiness. He doesn't grade on the curve. Jesus said: "Be perfect, therefore, as your heavenly Father is perfect." If we're being honest, we all have to say, "Are you kidding? No way. I may be a pretty good person in my own eyes, but no way am I perfect. Even Mother Teresa wasn't perfect." And this is truth. I recently took a test online (http://www.fbbc.com/messages/kohl_live_ten_commandments.htm) to see how I measure up against God's standard of perfection, the "Ten Commandments." 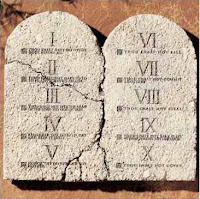 The test goes through each of the 10 Commandments one at a time. Some are hard ("Do not bear false witness." Have I ever lied? Even once? Well, unfortunately, yes ... actually, many times.) Some seem easy at first ("Do not murder. Do not commit adultery") ... but you see how badly you have failed when you realize that Jesus defined murder and adultery a lot more strictly than we do (in the Sermon on the Mount he taught: "You have heard that it was said to the people long ago, ‘You shall not murder, and anyone who murders will be subject to judgment.’ But I tell you that anyone who is angry with a brother or sister will be subject to judgment."). To Christ, if you've ever hated someone in your heart, you have committed murder. If you've ever lusted after a woman in your heart, even if you didn't literally touch her, you have committed adultery. Have I ever hated? Have I ever lusted? Sadly, yes. To God, goodness and evil are internal as well as external. He alone judges the heart. 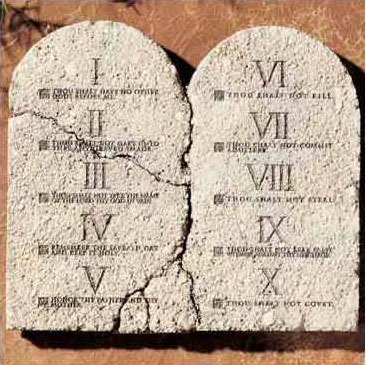 I discovered after taking this test that, according to Christ's standard of measure, I've broken each and every one of the 10 commandments! God doesn't grade on the curve. He doesn't look at Mother Teresa and say, "Yes, she is so much better than Adolf Hitler. Therefore she gets in, and Adolf Hitler doesn't." He looks at each of us and says, "There is none righteous, no not one." None of us meets His standard. We all stand condemned in the judgment. This is a terrifying thought, but it is the truth from the Bible. But that's why the Gospel is called "Good News," because its central message is that, while we all deserve condemnation, Jesus came to pay the price for our sin. He took our imperfection on Himself on the Cross and put His perfection upon us. The Apostle Paul wrote: "There is therefore now no condemnation for those who are in Christ Jesus." So the question is no longer "How good are you?" or "How bad are you?" The question becomes: "Are you in Christ Jesus? Have you received His forgiveness for your sin and committed yourself to living for Him?" Indeed, the person who has done this should not be a hypocrite. Scripture teaches that the person who is "in Christ Jesus" is in the process of being changed by the Holy Spirit to be more like Jesus. Their lives should be a reflection of God's glory. They should care for the poor and love their neighbor. They will still not be perfect, but with the help of the Holy Spirit they should be walking the road toward God's standard of holiness. Raman, does this all make sense to you? This is the message of the Bible, even though in some respects it seems to us counter-intuitive. It requires a great deal of humility, because it requires of us a confession that each of us has sinned and can never meet God's standard of holiness. But it is also incredibly freeing. Once you realize that you don't have to "prove yourself" to God, that He absolutely loves you for who you are, it is incredibly freeing. Personally speaking, my life has been so blessed since I discovered this truth at a very young age. But we're never too old or too far gone to receive God's forgiveness. To the thief on the cross, who humbled himself before God scant hours before his death, Jesus declared: "Today you will be with Me in paradise." God is merciful and full of compassion! He wants to accept YOU. Have you ever taken that step to acknowledge before God your sin, to receive the forgiveness in Christ's blood? I challenge you to do that today. Put God to the test. Tell Him: "I will do what you ask and humble myself before you. I receive Christ's forgiveness for my sin. Now prove Yourself faithful to me."